This is not Sunday school. This is not Hebrew day school. This is up-to-the-moment time-tested ancient brilliance to rock a meaningful life. 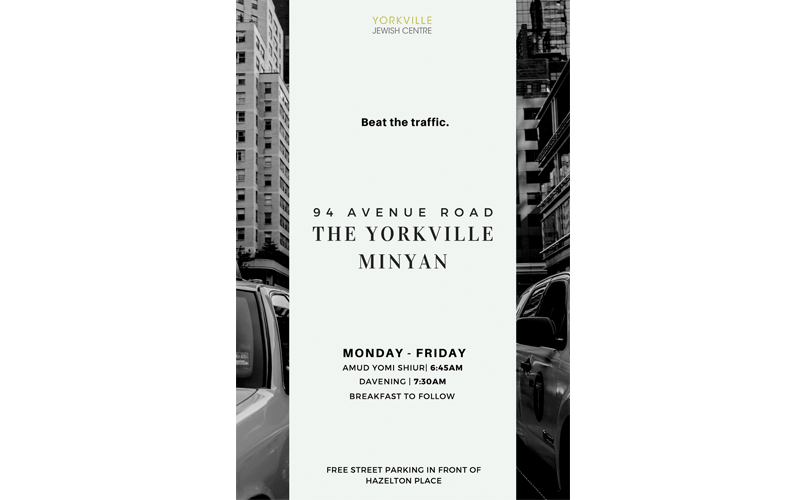 Yorkville Jewish Centre provides an exciting and enlightening opportunity to learn to use Jewish wisdom to design a life you love. Whether your interest lies in personal development, spirituality, intellectual analysis, philosophy, or Kabbalah, we are here to help you use Jewish wisdom to grow on your terms. Join us for Kabbalat Shabbat weekly at 7:30pm at the Yorkville Jewish Centre. Wake your mind up every morning with Rabbi Winston’s Amud Yomi shiur at 6:45am followed by davening at 7:30am. Coffee available.